The church was meant to replace the ageing St Mathew's, buily by by Bishop Hildesley, but took some 20 years to complete due to financial depression following act of revestment. 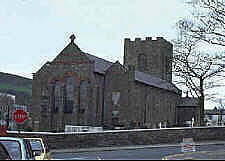 It was St James in Whitehaven that provided the initial design. The church was lengthened by some 5m in 1909 when a new chancel was built. See http://welcome.to/st-georges-pc-douglas for a virtual tour of the church.